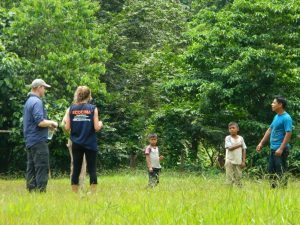 During the faculty led research course to Guatemala, we spent several days in the stove factory owned outside of the city of Antigua, which is owned and operated by a local Guatemalan family. Dr. MacCarty and several of the engineering students were completing stove testing of the new “Eco-plancha” model that the factory owner had developed. 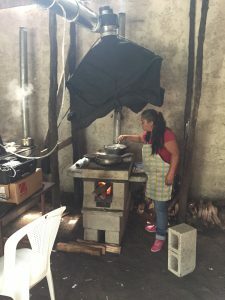 I had the opportunity to help with and translate for the stove testers for two days while they were working to complete the Controlled Cooking Tests (CCT). 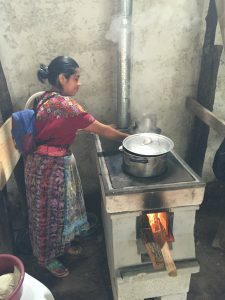 These tests utilize local cooks who are asked to cook the same meal on two types of stoves, in this case a basic three-stone open fire and the Eco-plancha model of interest. After the meal is complete, the time spent, amount of firewood used, and weight of the food are recorded to allow comparison between the two stoves. In addition to the technical measurements, we also interviewed the local cooks about their experiences and preferences. Six local cooks participated in the CCTs, so three at a time on the traditional open-fire and the plancha stoves. 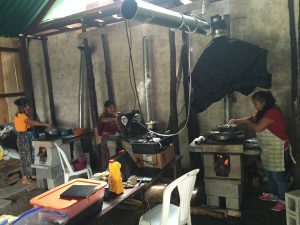 One thing that was interesting to me talking to the cooks is that the experience seemed to help them better understand the benefits of the plancha stove because they had the opportunity to see side-by-side the experiences of cooking on each type of stove. For example, the three cooks that were working on the plancha stoves finished there tests much quicker than those that were working on the open fires, and they joked and teased each other about how those that used the open fire smelled smoky and had to work harder on their fires. While all the women had plenty of experience having used both open-fires and the plancha model to cook in their homes, they had never had the opportunity to make that direct comparison between the two stoves. It seemed to surprise them to see how different the two methods of cooking performed, and how much less smoke was produced by the plancha. It was nice to be able to share that experience with local women who are part of the target audience of improved cook stove projects and for them to get to be included in the process of understanding the stove benefits. One cook wore the backpack emissions monitor to compare smoke inhalation levels for the two stoves.